A few weeks ago, Cindy O’Donnell-Allen and Antero Garcia, both professors in the English department at Colorado State University and fellow NWP colleagues, shared with me via e-mail that students in their pre-service teaching courses would be taking a closer look at a resource I developed earlier this year on Digital Is, offering me full warning that my inbox would be full of notification e-mails as students initiated and responded to message threads. Happy that the work found its way into another classroom, and excited to connect across spaces, I responded by offering to video chat with Cindy’s class one evening if the students wished to continue the conversation. From here, a kind of “dialogic ecosystem” grew that pushed me to think about how important spaces like Digital is are/can be, especially when we are attempting to make sense of loaded terms and concepts that can be challenging to dissect, deconstruct, and apply in practice. Most recently, Cindy has been exploring concepts like power, positionality, and culturally responsive teaching with her students, and has used a variety of texts and resources to color the conversation- including Digital Is. This led me to ask if we are using, as a field, places like Digital is to their fullest potential. How might we build powerful relationships through engaging in the site, and how might our writing pedaogies be stretched and flexed through such interactions? I offer this narrative because I thought it was an excellent testament to the kinds of collaboration and connected learning spaces that can grow out of the site, the benefits of which I am only beginning to fully comprehend. For instance, because of Cindy’s invitation to participate with her brilliant students, I have new insights about my own teaching practice, and have now created a different set of questions to ask students in my own class of pre-service English Teachers here at Teachers College. And according to Cindy, the students in her class found the work equally useful, one student noting after our Google Hangout session, “she’s made all this real because she’s really done it”. As I mentioned above, a “dialogic ecosystem” took root in this exchange; Digital is permitted us to participate in a dialogue that was reciprocal and expansive, and an interdependent set of relationships with people, space, texts, and terms took effect. When I wrote up my experiences, I did not anticipate all of the many layered nuances of what I was offering to my audience. Teaching is such a complex task, and after nearly ten years in the classroom, there are so many practices that I “do” that come almost second nature. Comments like the ones above brought me to pause and reflect on what my set of practices actually “say” to my students. I noticed that Cindy’s students were especially interested in the classroom climate and culture, and how the physical space itself spoke to that. Many of their questions also pointed back to considering what the purpose of education was, but considering such given the introduction of a new set of tools. After the Digital Is transactions, we participated in a Google Hangout during the last half-hour of Cindy’s class, thanks to the recording skills of Antero, who recorded it live. Students put me on the hot seat with some honest, straightforward questions that I found myself still contemplating afterward. What I was most impressed with was their level of consciousness and empathetic sensibility- these students seemed to really be able to put themselves in the shoes of students when thinking about constructing a classroom space and were well aware of their power and positionaility as teachers. One student asked, knowing that I am a white woman who has spent her career in urban education settings, ” If you consider yourself an outsider to your students’ community (in terms of race, etc. ), what’s the best way to be effective in that community? Wow. As I began to explore the beginnings of an answer to share, I realized that this was a question that I needed to be more intentional about exploring with my own student-teachers. I had to give that question to them, and probably needed to return back to my own articulation of a response. 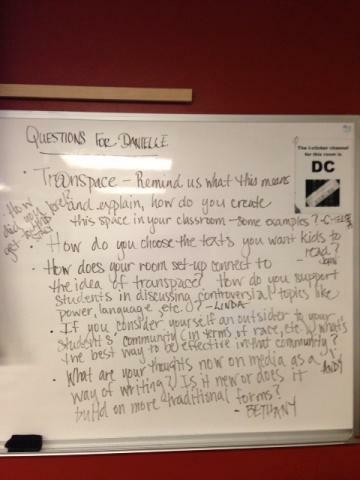 I shared with the class that their questions were ones that I did not hear often during my pre-teaching experience over a decade ago, and that I was deeply moved and inspired by their thought and consideration as they began constructing their own teaching pedagogies. It was humbling. How can we use places like Digital Is to build stronger relationships between teachers in organic ways? What kinds of new, inter-generational relationships can digital media tools help foster in teacher learning communities/classrooms? Do/can digital media tools help new teachers (or veteran, for that matter) engage in conversations that might have traditionally been too risky or uncomfortable? What kinds of questions would Cindy’s students ask my former high school students if they had the opportunity? Could Digital Is be a place where K-12 students might be able to participate in discussion threads? If so, what might resources that bring in youth voice look like? How might pre-service students use a space like Digital Is and its content to collaborate, question, share, explore with other pre-service students? As Cindy mentioned on her blog, one of my statements during our conversation was, “this work isn’t easy; teaching isn’t easy, though it may look that way on Digital Is.” This, for me, is why dialogue is so important and necessary. Teaching is a messy, but utterly beautiful process- and we have to re-visit our practices and pedagogy constantly. In my case, I was able to do so with new teachers who have different questions then I had when I first entered the field. They prompted me to re-think what it means to be an English teacher and further- to be a teacher of English teachers. Their questions also pushed me to consider why I placed such a strong emphasis in my classroom on youth cultural production via the use of digital tools, and I have been sketching & writing on this since. This exchange fed me, in many ways at a most unexpected time- prompted by little more then an e-mail. Roland Barthes said that “Narrative is determined not by a desire to narrate but by a desire to exchange”, and it is in this spirit that I end this piece and extend an invitation to teachers and Digital Is colleagues. What can we do with the work we have generated so far to connect to each other and build relationships? Why do we share in these spaces and what do we hope our audience will hear?